Quad mountings on Strasbourg. Note the range finder atop the turrets and the close barrel spacings. Photograph from the collection of Robert Dumas. The Model 1932 was specifically designed for the Dunkerque class and was the first dual-purpose (DP) gun ever used as secondary armament on a capital ship. 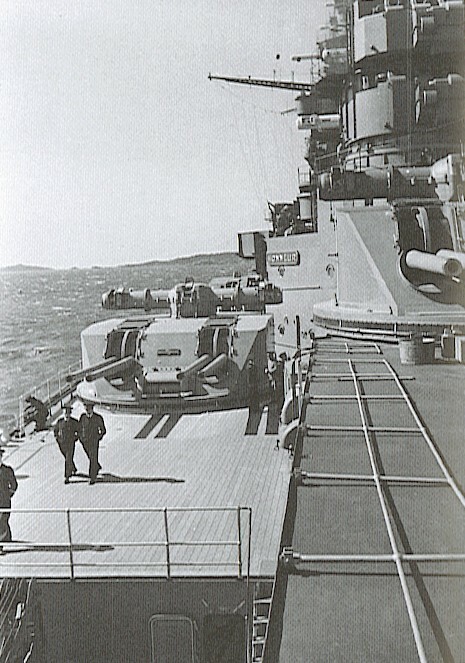 The guns were used in three quad and two twin mounts. The quad mount version of these guns was similar to the 330 mm (13") main guns in that they were really two dual gun mounts merged into a single turret. This DP design was not successful, as the very complicated semi-automatic loading mechanism was prone to jamming. The very high weight of the fixed ammunition led to rapid crew fatigue and much slower rates of fire. The Model 1935 was a SP gun used on the first eight units of the Le Hardi destroyer class. Only two of these ships, Le Hardi and Fleuret, were close to being completed before the Armistice. These two destroyers plus L'Epée were eventually completed and formed the 10th Division de Torpilleurs, but there is evidence that their armament was not fully functional. 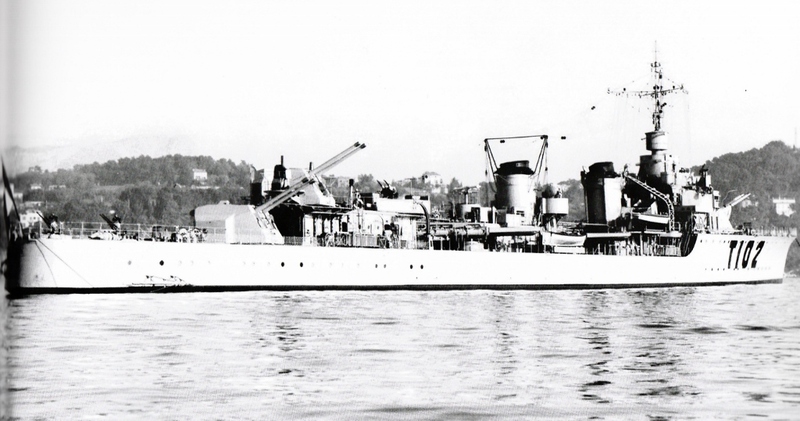 In an engagement with the British destroyer Hotspur on 25 September 1940, L'Epée fired only fourteen shots before all of her 130 mm guns developed defects and were rendered useless. In this same engagement, Fleuret did not fire a shot as her fire control equipment could not follow the target. However, Le Hardi at Dakar the previous day fired 60 rounds without suffering a breakdown and was able to bracket her target with her first salvo. In 1938, consideration was given to arming the last eight units of the Le Hardi class with the DP Model 1932 in order to improve their AA capability. None of these ships were completed before the Armistice. Used an autofretted barrel and a breech ring. The breech block was vertically sliding in the DP version but horizontally sliding in the SP version. Both breech mechanisms were semi-automatic. ^The sources below disagree as to projectile weight. I have chosen to use those given in "French Battleships: 1922 - 1956" and "Naval Weapons of World War Two." ^Outfit for Dunkerque as completed consisted of 2,000 SAP and 4,400 HE and Starshell. ^Ready ammunition in the quad mount rotating structure was 32 AA rounds and 16 surface rounds. ^Outfit for Le Hardi was 1,020 SAP rounds and 60 starshell. ^1.11.2The DP mountings had a double hoist for each gun, one for AA rounds and one for surface rounds. Rounds were passed by hand to the hoists which came up by the outer cradle trunnions of each pair and the rounds were passed to the loading tray by a combination of hydraulically powered tilting and rotating trays and slide tracks. Rammers were pneumatic with the breech closing automatically after ramming. Firing automatically ejected the cartridge case onto the loading tray after which it was manually passed onto a conveyor. The distance between gun axes for the Quad DP mount was 21.7 in (55 cm) between pairs and 96.5 in (245 cm) between the inner guns. Gun axes distance is unavailable for the Twin DP mount but is said to have been greater than that for the quad mount. There was a 0.8 in (2 cm) bulkhead extending about 65% of the turret length between the gun pairs. Training and elevation were both powered by 10 hp motors with Sautter-Harlé RPC. ^The quadruple mountings were developed by St. Chamond and do not appear to have been very successful, with the loading system in particular being prone to defects. ^The SP mountings were a base-ring type. The pusher hoists did not rotate with the mounting and instead fed a rotating tipping drum called a barillet de reception. The pusher hoists delivered four complete rounds (two per gun) to the drum where they compressed a set of springs and the drum then rotated to conform with the training angle of the mounting. The drum then tipped over horizontally and the springs pushed the rounds out onto upper and lower loading trays for each gun. Each gun had a powered rammer which proved to be underpowered and jams and breakdowns in the loading mechanisms were frequent. Gun shields were of the open-back type. Electric power was used for training and elevation. The distance between gun axes was 51.2 in (130 cm). Destroyer Le Hardi in April 1941. Marius Bar Photograph. Another view of Le Hardi. Photograph from the collection of Henri le Masson.